As much as I like to get my holiday shopping done early, I find December comes too early and we end up shopping with the crowd. 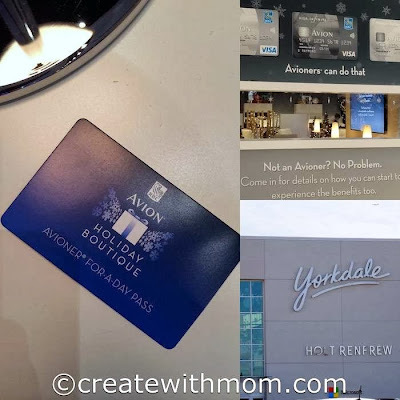 This year, we got to experience feeling like "royalty" as an Avioner for the day using the Avioner-For-A-Day Pass when we shopped at Yorkdale shopping centre. Finding a spot to park at Yorkdale can be very difficult, so to start us off in the right foot we drove to the valet parking section at Yorkdale mall and got to park our vehicle by valet for free. There are signs that lead us to this area. 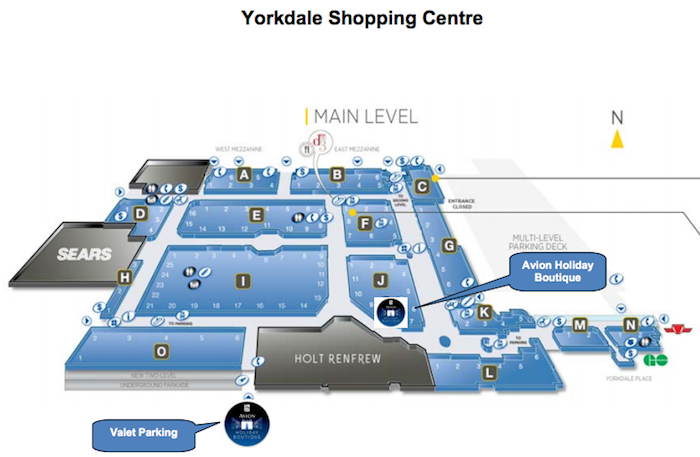 Then we went straight to the Avion lounge at Yorkdale, which is by Holt Renfrew and checked in our jackets using their Coat & Parcel check service. Having to lug winter jackets in a crowded mall and holding onto gifts isn't fun, so we were grateful to check the jackets in. We shopped for gifts for everyone on our holiday list and a birthday gift for my son's birthday in December. As a parent, walking around and shopping with kids can be tiring when we have to make sure our children are safe, keep an eye on them, and hear complains about "are we done yet?". So the best part of being an Avioner this year, was taking a pause and relaxing in the lounge. The atmosphere inside the RBC Boutique VIP lounge is very festive and beautifully decorated. We found everyone at the Avion lounge making sure that we were having a pleasant time. At the café inside the VIP lounge, we have a choice of having fruits, cookies and beverages. My family and I chose to enjoy hot chocolate, candy cane and shortbread cookies. We enjoyed our snacks, stretched our feet, read magazines and fun holiday stories with our little ones while sitting in the serene, homely, cozy lounge. While we were there relaxing, we used their gift wrapping service. The staff in the lounge wrap up to 10 gifts a day if we purchase the items on the day of, and show them the receipt. 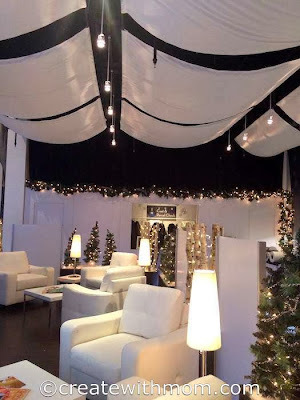 This special RBC Avion Holiday Boutique is a cool concept and is happening in four malls in Canada; Yorkdale in Toronto, Mail Champlain in Montreal, Coquitlam near Vancouver and the Halifax Shopping Centre from November 23rd to December 31st, so do visit one of these malls and enjoy this luxurious experience of being an Avioner this holiday. Watch this fast paced holiday video to see how we felt at the RBC Avion Holiday Boutique. One of the staff members in the lounge explained the different perks of being a RBC Visa Avion cardholder on top of all these holiday fun. When we become a RBC Visa Avion cardholder for a cost of $120 annual fees and $50 for each additional card we get 15000 welcome points and earn 1 RBC Reward point for every dollar we spend on purchases. We can earn bonus points when we shop through the RBC Rewards eMall™ There are also premium and extensive insurance packages including trip cancellation and protection for our trip, hotel, rental vehicle, and purchases. We can choose air travel rewards from the Air Travel Redemption Schedule starting as low as 15,000 points and fly on any airline, anytime with no blackouts or seat restrictions. We can also book travel rewards instantly. Only the RBC Rewards program has an online booking tool that is powered by Travelocity. Check out both the RBC Infinite Avion Card and the RBC Platinum Avion Card details to find out all the details. sounds like a nice place to shop to me ... relax in the VIP lounge away from the crowd and enjoy shortbread cookies and warm beverages, while our gifts get wrapped for free. That's a pretty nice lounge! Maybe I should look into getting one of those cards! Wow, those are really nice perks you had! I'm going to look into this card more; thanks for the information! Great idea, the lounge, to get away from the holiday madness at the mall! I've never heard of this before. Lovely lounge. I had no idea that avian afforded such amazing perks! I will have to get this card! The lounge is a great idea. I wonder how many husbands are camped out there while the wives shop? That would have a been such a wonderful experience. Thanks for sharing,what wonderful services .